The diagram below represents the twelve point approach of The Meeks Method. This comprehensive program is designed to prevent, arrest and/or reverse the common Patterns of Postural Change that occur as, but not necessarily because, people age. Below the diagram is a description of each point. Pre-Assessment and Assessment: Because patients do not routinely bring in a bone density or other bone health information on the initial visit, the physical therapist should conduct a pre-screening to determine whether or not the patient is at risk for osteoporosis or osteopenia. This pre-screening would include a questionnaire on Risk Factors and First Signs as well as asking questions about symptoms such as pain, neurological symptoms, weakness and history of falls. This pre-assessment would help the therapist determine both the tests to use for initial assessment and guidelines for exercise/movement intervention. Before any intervention is begun, the physical therapist should perform a complete assessment on the patient's condition. The tests performed should be valid and reliable so that the results can be used to measure progress. Assessment includes, but is not necessarily limited to, patient history (including any screening test results on bone density and/or absolute fracture risk (FRAX)), pain, body height, photos before intervention, posture screen, range of motion, strength, balance, gait, and functional ability. The results of these tests help determine intervention and, on re-test, can be used to objectively measure progress. Education: Education of the patient as to their condition, helping them interpret their medical tests, leading the patient to good books and videos-all of these will help empower the patient to deal with their specific medical condition. Through education, physical therapists can act as patient advocates to help people navigate the complex and sometimes confusing world of medicine. Site-specific Exercise: Research has shown that one of the two most important determinants of bone density (1/3 of bone health) is muscle contraction. Therefore, the more specific an exercise program can be in targeting the at-risk areas of the body, the stronger the bones will be and risk of fracture will be reduced. The Meeks Method specifically targets strengthening of the Erector Spinae, Gluteus Medius and Gluteus Maximus muscles, the primary support muscles of the spine and hips. Other muscles, particularly the abdominals, diaphragm, and pelvic floor are, of course strengthened as the entire body is taken into account. Research indicates that strengthening the erector spinae muscle group reduces the incidence of compression fracture in persons with osteoporosis (Sinaki, Itoi 2002.) Also, it has been shown that a decrease in hip extension is exaggerated in fallers and may limit performance (Kerrigan et al 2001) in the elderly. Stretching of the hip flexors and strengthening of the hip abductors and extensors are integral parts of The Meeks Method. In addition, The Meeks Method assesses joint range of motion, determines areas of restriction and flexibility with the intent to establish balance so as to increase the effect of muscle contraction on bone. bending over to pick up an object from the floor etc. and instruction in improved body mechanics early in the program can make a big difference both in the success of the program and the reduction of fracture risk. Postural Correction: Postural changes are frequently associated with osteoporosis, back pain and other pathology. Restoration of a more optimal anatomical alignment can help relieve back pain and other symptoms plus it can help assure better weight-bearing forces (see #7) through the bones and more specific muscle contraction on the bones, thereby positively affecting bone health and strength. Balance: Persons with poor balance tend to fall more easily than persons with better balance. If a person with osteoporosis falls, h/she is more likely to sustain a fracture which may be life-altering or even life-threatening. Prevention of the first or the subsequent fracture is the "bottom line" in The Meeks Method. Instruction in balance exercises may help prevent falls and fracture. Weight-bearing Exercise: Weight-bearing exercise is the second most important determinant of bone strength and is recommended for persons with osteoporosis. Weight-bearing exercise means bearing the body weight through the bones. Activities such as walking, dancing, jogging etc. would be classified as weight-bearing. Activities or exercises in hands/knee position or against the wall would be weight-bearing or partial-weight-bearing depending upon the position. Using a machine in the gym, in general, is NOT weight-bearing -- it is resistance exercise or weight training but not weight-bearing. Free weights are superior to machines because they add elements of weight-bearing, balance and coordination not available on machines. Teaching people to walk and move in better body alignment will increase the weight-bearing forces through the bones in a more anatomically-correct pattern, thereby helping to increase bone health and strength. Modalities: One of the basic principles of The Meeks Method is to prevent, arrest and/or reverse the Patterns of Postural Change. During the course of exercise instruction, some pain and discomfort may arise. These symptoms may be related to the exercise program itself. The use of electrical stimulation with pad electrodes along the erector spinae, moist heat and/or cold packs, massage, Myofascial release, and ultrasound may be used in local areas to relieve symptoms and augment treatment. Symptoms that occur during the program may also be related to old injuries and/or surgeries that "re-surface" as alignment improves (see The Peeling of the Onion concept below)*. It is important to treat these symptoms as they occur to ensure success of the program. Bracing: Many people with osteoporosis and other back pathology have long-standing postural changes (most often, an increase in the thoracic kyphosis - called a hyper-kyphosis) so that they are unable to maintain their new posture that has resulted from the program. These people may need a brace. The one I recommend is the Spinomed which is available from mediUSA (www.mediUSA.com/orthopedics/mediortho) The Spinomed is a new concept in bracing in that it is an active brace. It directly supports the back and has been shown to increase the strength of the erector spinae muscle, reduce thoracic kyphosis, reduce pain, increase vital capacity, reduce limitations in ADL's, reduce body sway and improve well-being (Pfeifer 2004.) 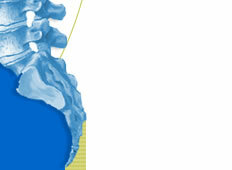 The Spinomed Brace is the most significant contribution to the conservative management of osteoporosis and compression fracture EVER in that it strengthens the body part that it is designed to protect -- the back. Breathing: Many persons with osteoporosis and other postural problems have compromised lung function. 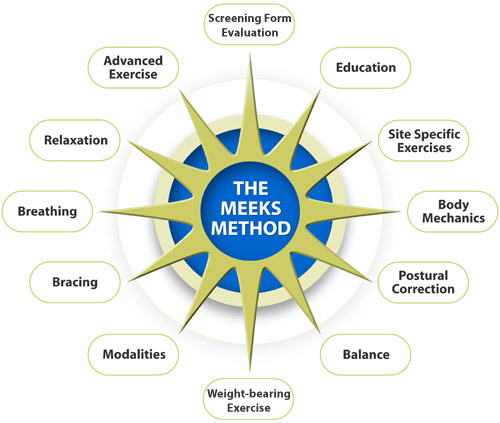 Assessment of breathing patterns and instruction in breathing exercises, targeting the intercostals and diaphragm muscles, is an integral part of the The Meeks Method. Because the diaphragm muscle also serves to help stabilize the back for movement of the extremities, it is vital to teach diaphragmatic breathing along with core control exercises to help strengthen this muscle. Relaxation: Many people with osteoporosis and other physical problems that bring them into a physical therapy office have anxiety, fear, depression and other emotions associated with the diagnosis. Instruction in relaxation techniques can help with these associated conditions. Advanced Exercises: After a 6-8 week physical therapy intervention, many people will want to continue a fitness program in the gym, a Yoga or Pilates class, or in some other exercise environment. The Meeks Method includes guidelines for safe and therapeutic movement in these environments and prepares the patient for the advanced exercises. In addition to the twelve basic tenets described here, The Meeks Method consists of advanced training for health professionals who are interested in learning how to move from, and with consideration of safety for, the bones. Leaning to move "from the inside out" can profoundly change the way you teach patients and exercise clients how to move and can also change your own life. * The "Peeling of The Onion"
As people live their lives, they may sustain bumps, bruises and more serious injuries and even surgeries along the way. When this happens, people usually develop compensatory movement patterns to avoid pain and to deal with the limitations of movement when they have pain. This process, that I call "Layering On Of The Onion", can go on for many years. Then, when a person begins a program, such as The Meeks Method, which is designed to bring the body back into better alignment, he/she may "re-visit" old injuries and surgeries that occurred in the past. The older the patient and the more chronic the condition, the more likely this is to happen. The therapist then needs to address the specific issue in order to assure continuation of the exercise program. One very common example of an old surgery that might re-surface is arthroscopic knee surgery. The patient may never have had physical therapy, or, if h/she did, it may have been just a few sessions and full knee extension might not have been attained after surgery. This limitation of motion would result in a gait with a slightly flexed knee and this change in gait pattern might create back pain. I have found that gentle mobilization, massage, and moist heat or ice combined with specific knee exercises such as quad sets (done correctly), isometric hamstring strengthening along with stretching of the posterior knee (origin of the gastrocnemius and insertion of the hamstrings) will usually resolve this problem area. Once this is accomplished, another area might re-surface and need to be dealt with also. Please contact me via email at if you would like to discuss this phenomenon in more detail. It is, to me, one of the things that distinguishes geriatric physical therapy from some others.